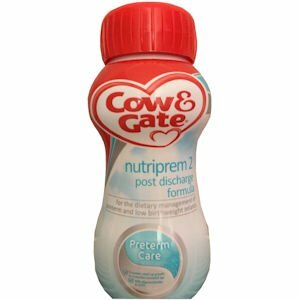 Cow & Gate Nutriprem 2 is nutritionally tailored to support the catch-up growth of preterm and low birth weight babies once they have been discharged from hospital. It is specially designed to help bridge the gap between a hospital preterm formula and a standard infant milk, and can be used under medical supervision until 6 months corrected age. 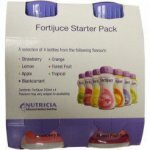 Please speak to your healthcare professional before moving on from Nutriprem. Wash hands. Ensure all equipment is sterilised. Ensure top of carton is clean. Shake carton well and cut open where indicated using a clean pair of scissors. Pour the required amount of milk into a sterilised bottle. Cow & Gate Nutriprem 2 can be given at room temperature, or warmed if desired. If warmed, check temperature of feed. For hygiene reasons, discard unfinished feeds in the bottle as soon as possible, and always within 1 hour. After opening, reseal the carton by holding down the spout. Unused feeds still in the carton must be refrigerated immediately and used within 24 hours. When bottle feeding do not allow prolonged or frequent contact of milk feeds with your baby’s teeth as this increases the risk of tooth decay. Ask your health professional or dentist for advice. Make sure your baby’s teeth are cleaned after the last feed at night. Never leave your baby alone during feeding. Cow & Gate nutriprem 2 post discharge formula is not a low birthweight formula and should only be used during transitional care, and thereafter in the community. Levels of most vitamins and minerals in Cow & Gate nutriprem 2 post discharge formula are higher than in infant milks used for term infants. 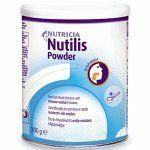 Cow & Gate nutriprem 2 post discharge formula is nutritionally complete therefore additional nutrient supplementation will not be needed for bottlefed preterm infants post discharge. This product is not suitable for intravenous use. Not suitable for vegetarians due to the processing of some ingredients and contains LCPs derived from fish oil. Demineralised water, Skimmed milk, Lactose (from milk), Vegetable oils (Sunflower oil, Rapeseed oil, Coconut oil (contains soy lecithin), Palm oil, MCT oil, Evening primrose oil, Single cell oil), Galacto-oligosaccharides (GOS) (from milk), Whey protein concentrate (from milk), Glucose syrup, Egg lipid, Fish oil, Fructo-oligosaccharides (FOS), Calcium phosphate, Acidity regulator (citric acid), Potassium chloride, Sodium citrate, Calcium citrate,Vitamin C, Inositol, Calcium hydroxide, Magnesium carbonate, Choline chloride, Vitamin E, Iron lactate, Taurine, Sodium chloride, Potassium hydroxide, Zinc sulphate, Vitamin A, Cytidine 5’-monophosphate, Niacin, Uridine 5’-monophosphate disodium salt, Vitamin D3, Pantothenic acid, L-carnitine, Inosine 5’-monophosphate disodium salt, Copper gluconate, Adenosine 5-monophosphate, Biotin, Guanosine 5’-monophosphate disodium salt, Potassium iodide, Sodium selenite, Folic acid, Thiamin, Riboflavin, Vitamin B6, Vitamin B12, Vitamin K1, Manganese sulphate.